The court granted plaintiff's motion to serve its declaratory relief complaint by alternate means on a Japanese defendant following defendant and its counsel's lack of cooperation. "[Defendant's] contention that it is 'simply' standing on its 'right' to service under the Hague Convention is ill-taken. . . . [Counsel's email exchange] shows that [defense] counsel declined to accept service in an apparent fit of pique, and the record of events after that indicates that [defendant] has been unduly difficult to serve in a manner reflecting the uncooperative spirit manifested in [defendant's lead attorney's] words. . . . In our circuit, Rule 4(f)(3) allows for service 'by other means' so long as it is directed by the court and is not prohibited by international agreement. There is no hierarchy of procedures, as [defendant] suggests, that requires [plaintiff] to attempt service through the Hague Convention or other means before seeking an order under Rule 4(f)(3). . . . [Defendant] has been uncooperative at every turn in responding to [plaintiff's] attempts to serve the complaint. It has not shown that service under Rule 4(f)(3) would violate an international agreement, and the Hague Convention is certainly no bar. Consequently, [plaintiff's] motion for an order of service under Rule 4(f)(3) is granted. . . . In situations like this, service on a foreign corporation’s counsel in the United States is an effective and reasonable method, and is not prohibited by the Hague Convention." The court granted in part plaintiff's motion to reconsider an earlier order granting defendant's motion for judgment on the pleadings that plaintiff's remote monitoring patents encompassed unpatentable subject matter and agreed with plaintiff that it lacked jurisdiction over the unasserted claims. 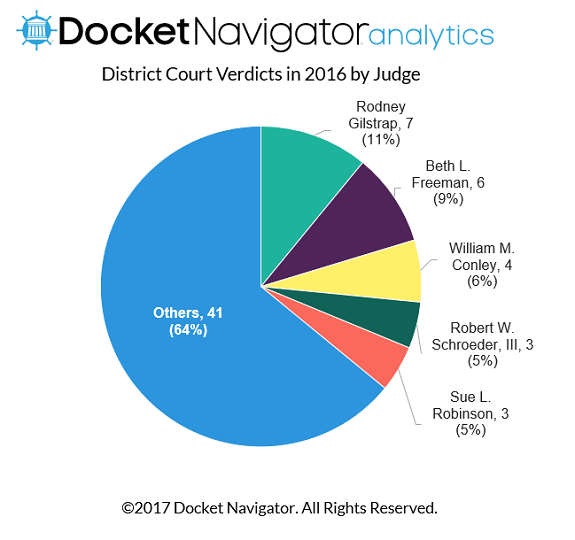 "[N]arrowing patent litigation to asserted claims pursuant to local patent rules can appropriately limit the court’s reach over other unasserted claims in the patent, even if those claims were at issue when the plaintiff filed its original complaint. . . . [Defendant also] urges that disclosures under this court’s local patent rules are insufficient to limit the scope of an invalidity counterclaim. . . . The parties’ patent contentions do not control the reach of the court’s jurisdiction, but they do influence the determination of whether there is, before the court, a substantial controversy. . . . [Defendant] effectively argues that because the case was before the court on a Rule 12(c) motion, the court must limit its analysis to the pleadings and must therefore exercise jurisdiction over the entire counterclaim. But the court is not constrained by jurisdictional assertions; in fact, the court will always independently examine whether it has jurisdiction over a particular declaratory judgment counterclaim. . . . The court in this case concludes it is not appropriate to ignore the impact of the parties’ contentions, even though they occurred after the pleadings." The court denied defendant's motion for judgment on the pleadings on the ground that plaintiff’s mobile navigation system patent encompassed unpatentable subject matter because the asserted claims were not directed toward an abstract idea. "Defendants argue that under step one, claim 15 is directed to an abstract idea because the claim is specifically directed to the idea of providing directions in a natural language. . . . Defendants argue that claim 15 is directed to an abstract idea because the claim is directed to a process that could be performed by a human with a pencil and paper. But a human with a pencil and paper cannot format route data into a natural language description that is generated on a server and then transferred to a local database. . . . [C]laim 15 is not directed to some abstract result or effect. Rather, claim 15 provides a specific technological means for remedying the specific problems with real-time mobile navigation systems that the [patent] sought to address: formatting the route data using a non-proprietary, natural language description." The court denied plaintiff's motion for summary judgment of infringement of a fungicide patent, but found that the burden to establish noninfringement should be shifted to defendant under 35 U.S.C. § 295. "[Plaintiff] contends that it made reasonable efforts to discover [defendant's Chinese manufacturer's] process for producing azoxystrobin technical, but that it has been thwarted by [defendant's] lack of full cooperation and its inability to get information from [the manufacturer]. . . . [Defendant] asserted that it had no written communications with [the manufacturer], because they corresponded only in person, via telephone, or via a chat program that did not save correspondence. . . . At his deposition . . . [the manufacturer's representative] affirmed that [the manufacturer] has production records with the ratios and quantities of materials used in the manufacturing process . . . but that no one associated with [defendant] informed him that [plaintiff] was asking for those documents, apart from sharing [a] July 28 letter about a month before his deposition. He did not produce any of these documents at his deposition, despite being aware that [plaintiff] had asked for them. . . . While [plaintiff] did not seek discovery directly from [the manufacturer] . . . it 'is extremely difficult, if not impossible . . . to compel the Manufacturer [in China] to produce any documents' . . . . Moreover, given [the manufacturer's] location in China, requesting voluntary facility inspections or observing the process firsthand are unlikely possibilities for discovering information." The court granted defendant's motion to dismiss because the asserted claims of plaintiff’s interactive toy patents encompassed unpatentable subject matter and found that the claims were directed toward an abstract idea. "Here, the Patents-In-Suit involve toys that communicate or interact amongst one another, with humans, or with computers. The toys generate, receive, and analyze sounds. They transmit, receive, and respond to a signal. They generate acoustic signals, receive the acoustic signals, analyze the signal, and then perform a responsive function. At core, the patents attempt to state methods for toys to communicate by sending, receiving, and responding to signals. The claims do not state a means by which to communicate, but rather are directed at the abstract process of communication itself. . . . Plaintiff attempts to characterize the patents as 'tangible toys or devices' and therefore not abstract. . . . The mere inclusion of tangible elements in an otherwise abstract idea does not render the subject matter any less abstract." Having previously observed that "the doctrine of laches likely bar[s] the plaintiff’s claims," the court denied defendant's motion for summary judgment on its laches defense in light of the Supreme Court's decision in SCA Hygiene Products Aktiebolag v. First Quality Baby Products, LLC, No. 15-927 (U.S. Mar. 21, 2017). "That decision has now been rendered, the Court holding that '[l]aches cannot be interposed as a defense against damages where the infringement occurred within the period prescribed by [35 U.S.C.] § 286. Accordingly, it appearing proper, it is ordered [that] [defendant's] Motion for Summary Judgment Based on Laches is denied." 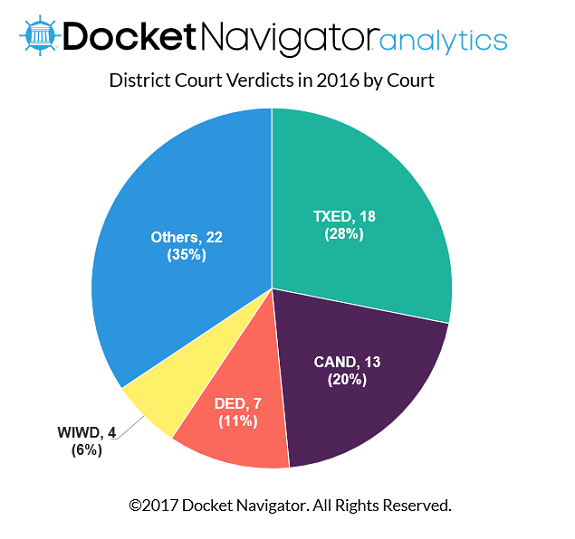 The court granted defendant's motion to dismiss because the asserted claims of plaintiff’s voting system patent lacked an inventive concept. "According to the complaint, the auto-verification voting system is made of generic computer components performing generic computer functions, including: inputting voting information, printing out a paper ballot, having the voter personally verify the vote, and inputting the verified vote into a 'tabulating' computer. There is nothing inventive or transformative about the functions claimed in the patent, as they encompass computer functions which are 'well-understood, routine, conventional activit[ies] previously known to the industry,' and thus, there is no transformative feature between the abstract ideas of voting and verification and the input of the given steps into a computer system." The court granted defendant's motion for summary judgment that it did not directly infringe plaintiff's bee trap patent because defendant's online marketplace listing was not defendant's offer to sell within the meaning of 35 U.S.C. § 271(a). "[Defendant's] website contained descriptions of the allegedly infringing products and a price at which the items could be obtained. As [plaintiff] observes, [defendant] tells users that bidding on a product creates a contract that obligates the bidder to purchase the product. . . . [Defendant] explicitly identifies a 'seller,' rather than a 'supplier,' on each listing, and no evidence is in the record that users pay [defendant] rather than the seller. . . . [T]he context of an exchange on [defendant's online marketplace website] demonstrates that no reasonable consumer could conclude that by bidding on [a] listing, he was accepting an offer from [defendant] itself. [Defendant's] terms of service explicitly advise users that [defendant] is not making an offer through a listing, and . . . [defendant] lacks title and possession of the items listed." The court denied defendant's motion in limine to exclude the testimony of plaintiff's damages expert for considering the pre-issuance value of the patented invention. "[T]here is no merit to [defendant's] argument that '[the expert's] opinion regarding the alleged value [of] the [patent’s] invention before it even issued is improper and should be excluded.' The economic data from the period before the issuance of the [patent] provided a sound basis from which to determine the value of the invention that was ultimately patented. . . . A patent does not have to be in existence in order to calculate the value that the invention would have, particularly if others are already practicing the invention in the market when the patent issues. . . . [Defendant] is correct that those earlier sales were not infringing sales, and therefore may not be included as contributing to the assessment of damages. But [the expert] committed no such error. . . . [He] began with the number in dispute and then accounted for several other variables, including deducting noninfringing profits, before ultimately deriving his estimated reasonable royalty rate. The initial number was an essential part of [his] model for calculating damages and is therefore a legitimate and relevant part of his damages analysis." The court granted a third party customer's motion to quash defendants' deposition subpoenas regarding plaintiff's lost profits claim because the discovery was not relevant. "Defendants argue that showing that [their customer] would not have purchased Plaintiff’s [product] even if the [accused product] was not on the market would defeat Plaintiff’s lost-profits claim to the extent that it is based on Defendants’ sales to [their customer] because it would demonstrate that Plaintiff would not have made the sales 'but for' the [accused product]. . . . Defendants contend that there is no need to look to [a] hypothetical marketplace when evidence about a what market participant would have done is available from the market participant itself -- in this case, [defendant's customer]. . . . The parties have not provided, nor has this Court’s independent research discovered any case law directly addressing the relevance of a market participant’s belief that if the infringing product had not been available, the market participant would have purchased no product rather than purchasing the patented product. . . . [T]he focus is not the subjective desires or retroactive beliefs of market participants, but rather the appropriate focus is the objective analysis of whether other acceptable noninfringing substitutes were available. . . . None of the factors for consideration under either the Panduit test or the two-supplier market test includes contemplation of subjective buying decisions by market participants, which is the information Defendants’ subpoena seeks to elicit." The magistrate judge recommended granting defendants' motion to dismiss plaintiff's patent infringement claims for one patent-in-suit because the patent expired before it issued. "A patent’s term begins on the date of issuance and ends twenty years after the filing date of the earliest filed non-provisional application to which it claims priority. . . . [One patent-in-suit] expired on June 8, 2015 -- more than a month before it issued on July 28, 2015 -- and therefore it had no enforceable term. . . . If the statute were construed as [plaintiff] proposes, i.e., so that an expired-when-issued patent had some indefinite term extension past the ordinary twenty-year mark to be determined by the Court, then the public would have no notice as to when such patent term would end. Clearly, that cannot be the case." The magistrate judge recommended granting defendants' motion to dismiss two of plaintiff's patent infringement claims for failure to state a claim. "Defendants argue that the no plausible construction of the claim term 'TV Channel' results in a uniform resource locator (‘URL’) meeting the TV Channel limitation as alleged. The Court agrees. . . . Having reviewed the parties’ arguments, the specification, and the portions of the prosecution history cited in the briefing, [plaintiff] has no plausible basis for alleging that the plain and ordinary meaning of ‘TV Channel’ (or ‘TV Channel’ properly construed) covers URLs, i.e., a unique address for a web page that makes content addressable on the Internet. The Supreme Court has opined that 'determining whether a complaint states a plausible claim is context-specific, requiring the reviewing court to draw on its experience and common sense.'. . . [T]his case falls squarely into the narrow slice of cases where based on the claims, specification, its experience, and common sense, the Court can readily conclude that plaintiff’s infringement allegations are implausible on their face." Following a jury trial, the court denied defendant's motion for partial judgment that plaintiff’s malware monitoring patent encompassed unpatentable subject matter because the asserted claims did not lack an inventive concept. "[T]he claims recite an inventive concept when taken as an ordered combination and considered in context. The [patent] notes that, prior to its invention, malware protection programs were only able to detect and protect against known viruses and were installed on particular user computers. The [patent] details a new kind of virus protection: one that is located on a network computer, rather than the end-user computer, and which is able to detect unknown viruses by identifying suspicious components in unique and novel code. The [patent] therefore includes a 'non-conventional and non-generic arrangement of known, conventional pieces' such that, when taken as an ordered combination, it recites an inventive concept." The court granted defendant's motion in limine to preclude plaintiff from referring to the presumption of validity as unduly prejudicial. "[Defendant] contends that the phrase 'presumption of validity' is potentially confusing to the jury and should not be used at trial. . . . What is clear from the case law . . . is that prohibiting the use of that phrase is not error. . . . In the Court’s judgment, the use of the phrase 'presumption of validity' would add little to the jury’s understanding of the burden of proof on the validity issues. Moreover, the phrase might be confusing to the jury, to the extent that the jury is required to consider both that phrase and the Court’s instructions on the burden of proof. At minimum, the use of the term 'presumption' would require a further definitional instruction by the Court, without leading to any greater insight on the jury’s part as to the nature of the burden of proof on the validity issues. Accordingly, the Court will exclude the use of the phrase 'presumption of validity' and instead will address the burden of proof in its instructions to the jury." The court granted defendant's motion for judgment on the pleadings because the asserted claims of plaintiff’s patent for providing and using feedback based on data gathered from subjects encompassed unpatentable subject matter and found that the claims were directed to an abstract idea. "[T]he Asserted Claims recite the abstract idea of providing and using feedback based on data gathered from subjects. . . . [H]umans have received and assessed information and thereafter provided feedback to one or more people from time immemorial. The aggregation of information and the use of information to provide advice to people is a practice that has long existed. . . . Information gathering from particular sources through the use of sensors, absent uniqueness of a sensor, does not change the nature of the information gathering. . . . [T]he [patent] does not disclose any unique sensor or require any special hardware or programming. . . . [T]he Asserted Claims are directed to the abstract idea of providing and using feedback based upon data gathered from subjects. Controlling precedent establishes that the idea of collecting and analyzing information or data, even when particularly limited, is an abstract idea under Section 101." The court denied defendant's motion to dismiss on the ground that plaintiff’s patent for extracting and embedding digital images within a video encompassed unpatentable subject matter because the asserted claims were not directed toward an abstract idea. "Users of the [accused] product are . . . able to select a portion of . . . captured images along with a portion of [an] original video data stream. The product’s digital processing unit then uses its memory and processing components to 'spatially match the second image (from the user input video data stream) to the first image (from the original video stream).' This process substitutes the first image with the second image—i.e., the 'user-selected "Best Face."' . . . [Plaintiff] alleges that the above violates [the patent-in-suit]. . . . [Defendant] seeks to oversimplify the [patent] in arguing that the 'Best Face' invention uses a generic computer function to perform an action that could be performed by a human by cutting-and-pasting. The Court declines to equate the 'Best Face' technology with 'arts and craft classes' or making collages. . . . [T]he [patent] describes more than just a 'generic computer performing a generic function.' To grant [defendant's] Motion to Dismiss on the basis of patent-ineligibility would run contrary to the warnings in [Alice Corp. v. CLS Bank Int’l, 134 S. Ct. 2347 (2014)] and [Mayo Collaborative Servs. v. Prometheus Laboratories, Inc., 132 S. Ct. 1289 (2012)] that courts not construe the categories of patent ineligible subject matter too broadly." The court granted defendants' motion to dismiss because the asserted claims of plaintiff’s ten financial product patents encompassed unpatentable subject matter and rejected plaintiff's argument that it was improper to invalidate all 974 claims based on ten representative claims. "[Plaintiff] argues that Defendants’ mere mention of ten claims is not clear and convincing evidence that all of the claims in all of the asserted patents (totaling 974 claims) are directed to ineligible subject matter. . . . On balance, the Court finds Defendants’ use of ten representative claims that summarize claimed features from all asserted claims is permissible and reasonable under the circumstances. . . . Defendants’ selection of representative claims and their diligence in explaining how those representative claims address features covered by all asserted claims [is] not only reasonable, but necessary, considering how the Court would be unduly burdened if it had to entertain 'rigorous analysis of every single claim [out of potentially 974 total claims], and of each limitation individually and as an ordered combination' as [plaintiff] suggests." The court granted an intervenor's motion to preclude disclosure of the intervenor's confidential technical information to plaintiff's expert because the expert designed products for intervenor's competitor. "While the Court recognizes and appreciates the difficultly for Plaintiff in obtaining qualified experts, the risk of inadvertent disclosure that arises from [the expert's] ongoing design work for a competitor company outweighs that difficultly. 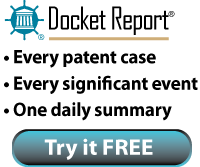 Moreover, the difficulties here are alleviated by the fact that Plaintiff has another technical expert. . . . [Plaintiff's expert] is free to review [a defendant’s] confidential materials as there is no dispute over [his] review of those materials. The only exception of course is those documents produced by [the defendant] that contain [intervenor's] confidential information. In addition, the Court is willing to accommodate the special circumstances in providing testimony from the experts at trial." The court denied defendant's motion to dismiss on the ground that plaintiff’s two way location tracking patents encompassed unpatentable subject matter because the asserted claims did not lack an inventive concept. "Combining the dynamic 'buddy list' and 'use specific group' systems to GPS tracking constitutes a 'non-conventional and non-generic arrangement of known, conventional pieces.'. . . Instead of requiring a manufacturer to permanently link the two wireless devices, as in the child-tracking prior art, the users of the [patents-in-suit] can add or remove persons being tracked through modifications of the buddy list or through the creation of a use specific group. . . . [T]he combination of a dynamic buddy list or use specific group and GPS technology transforms the abstract idea of the gathering, transmission, and display of the location information of a certain subset of individuals from a list or individuals requested to perform a service into a 'specific, discrete implementation' of this idea that is sufficient to qualify as patent-eligible subject matter." The court denied defendant's motion for summary judgment that it did not willfully infringe plaintiff's prostate treatment patent because defendant failed to present evidence of its subjective beliefs. "The Court recognizes that the arguments [defendant] has made in its summary judgment motions of noninfringement and invalidity provide some support for its contention that it was at least not clear that the patent was both valid and infringed. The Supreme Court has made clear, however, that the issue of willfulness turns not on the objective reasonableness of the defendant’s conduct, but on the defendant’s subjective beliefs. A jury might well conclude from the objective evidence . . . that [defendant] did not subjectively believe it was infringing a valid patent. . . . But [defendant] has offered no other summary judgment evidence going to the subjective beliefs of its decisionmakers." The court granted defendant's motion for judgment on the pleadings because the asserted claims of plaintiff’s physical activity detection patent encompassed unpatentable subject matter and found that the claims were directed toward an abstract idea. "[Plaintiff] argues that Defendants’ conception of the asserted claims is too high-level, and overlooks the fact that they claim a specific structure (e.g., a wearable band with a motion detection component and LEDs) that provides this technological improvement. The Court agrees with Defendants that claim 20 is directed to an abstract idea. . . . [T]he wearable band with a motion detection component and LEDs 'merely provide a generic environment in which to carry out the  idea of [collecting and reporting data on cumulative physical activity].' This adds little to the substance of the claim. Instead, the focus remains on the collecting and reporting functions themselves. So characterized, the 'character as a whole' of claim 20 is an abstract idea." The court granted defendant's motion for judgment on the pleadings because the asserted claims of plaintiff’s physical activity monitoring notification patent encompassed unpatentable subject matter and found that the claims were directed toward an abstract idea. "[Plaintiff] responds that the asserted claims are not drawn to an abstract idea because they recite a specific improvement in portable activity monitoring devices: a notification solution that ensures that a user will receive the notification at the time he will be able to view and comprehend it. . . . Assessing their 'character as a whole,' these claims are directed to collecting and analyzing information to detect a particular condition, and notifying a user at a particular time when that condition is detected. They are not directed to anything more technically specific -- the claims do not focus on (or even recite) specific algorithms or give technical details about structures that must be used to perform the claimed functions. Instead, they focus on the high-level functions of collecting, analyzing, and notifying themselves. This focus is an abstract idea." The court denied defendant's motion for judgment on the pleadings that the asserted claims of plaintiff’s biometric monitoring device patent encompassed unpatentable subject matter because the claims were not directed toward an abstract idea. "Evaluating the claims in light of the specification for their 'character as a whole,' the Court finds that the asserted claims are directed to a particular variant of heart rate data collection: selective heart rate data collection through minimized user interaction. . . . [T]hese restrictions comprise a substantial portion of the collective substance of the claims and color their character as a whole. . . . By automating the point at which data collection stops and combining that with a single-gesture trigger, the [patent] claims focus on an improvement to heart rate monitors as a technological tool, which overcomes the problem of bulky user interfaces and provides a way to more easily and efficiently gather a selective heart rate reading." The court granted plaintiff's motion for summary judgment that its server load balancing patents were not invalid as obvious because defendant was estopped from asserting its prior art combinations following inter partes review. "[Defendant] seeks to invalidate the asserted claims based on prior art combinations of which it was aware before it filed its IPR petitions. . . . In [defendant's] view, the fact that it sought joinder with [another petitioner's] IPR proceedings means that it would have been unreasonable for it to have raised any invalidity arguments that were not presented in [the other petitioner's] IPR. Despite [defendant's] claims to the contrary, there is no 'mirror image' rule for joinder. To the contrary, the cases [defendant] cites for support explicitly contemplate that requests for joinder can involve petitions that assert different grounds of invalidity. . . . Allowing [defendant] to raise arguments here that it elected not to raise during the IPR would give it a second bite at the apple and allow it to reap the benefits of the IPR without the downside of meaningful estoppel." The court partially granted plaintiff's motion to compel the production of defendant's communications with third parties that referred to plaintiff or the patent-in-suit and rejected defendant's argument that it was not obligated to produce foreign language documents. "[Defendant] argues that it is not obligated to translate documents from Mandarin to English to determine whether the documents are responsive to these and other discovery requests. Its counsel cites no authority supporting this position. Courts have held that the producing party has no obligation to translate documents produced in discovery into English, but I have not located any authority for the proposition that a party can avoid producing documents responsive to a discovery request that are in a foreign language. Accordingly, [defendant] cannot avoid producing responsive documents merely because its counsel cannot comprehend the documents written in a foreign language." The Board denied institution of covered business method review of a patent directed to a system for delivery of targeted advertisements, finding the patent was not directed to a financial product or service. "[Petitioner] contends the independent claims 20 and 25 each recite features relating to the presentation and monetization of advertisements. . . . We agree with [patent owner] that, based on the Federal Circuit’s new guidance in [Unwired Planet, LLC v. Google Inc., 841 F.3d 1376 (Fed. Cir. 2016)] [petitioner] has not demonstrated that at least one challenged claim of the ’651 patent is directed to a method or apparatus for performing data processing or other operations used in the practice, administration, or management of a financial product or service. . . .We agree with [petitioner] that these claims generally apply to Internet advertising. The Federal Circuit, however, explained in Unwired Planet that claims broad enough in scope to cover the facilitation of advertisement, without more, are not enough to justify concluding that a patent is a covered business method patent eligible for review. . . . [A]lthough Internet advertising might lead to a sale of a good or service, mere probabilities or possibilities fall short of demonstrating operations necessarily used in the practice, administration, or management of a financial product or service." ​ The Board denied institution of covered business method review of a patent directed to on-line or web-site registration, finding the patent was not directed to a financial product or service. "[O]ur focus is on what the ’792 patent claims, not solely the exemplary embodiments described in the Specification, some of which are related to finance and some of which are not. . . . Petitioner argues that [Unwired Planet, LLC v. Google Inc., 841 F.3d 1376, 1382 (Fed. Cir. 2016)] requires the Board to 'strike the proper balance between (1) an invention of general usage that could also be used in the administration of a financial service and (2) an invention that is used in administration of a financial service but that could also be used for non-financial purposes.' Petitioner, however, does not quote anything in Unwired Planet for this proposition, which appears to contradict the Federal Circuit’s direction that covered business method patents 'are limited to those with claims that are directed to methods and apparatuses of particular types and with particular uses ‘in the practice, administration, or management of a financial product or service,’' and '[i]t is not enough that a sale . . . may occur, or even that the specification speculates such a potential sale might occur.'" The Board denied institution of covered business method review of a patent directed to a system for delivery of targeted advertisements, finding the patent was not directed to a financial product or service. "According to Petitioner, the systems and methods for delivering targeted advertisements are financial in nature because someone receives money to deliver advertisements about a product or service. . . .We agree with Patent Owner that, based on the Federal Circuit’s new guidance in [Unwired Planet, LLC v. Google Inc., 841 F.3d 1376 (Fed. Cir. 2016)], Petitioner has not demonstrated that the challenged claims of the ’393 patent are directed to a method or apparatus for performing data processing or other operations used in the practice, administration, or management of a financial product or service. . . . An advertisement is not considered an 'offer for sale' under traditional contract law and it does not require or guarantee a sale or any financial transaction will occur. . . . Although targeted advertising might lead to a sale of a good or service, mere probabilities or possibilities fall short of demonstrating operations necessarily used in the practice, administration, or management of a financial product or service."